Corruption in MDB files can occur due to multiple reasons like virus attack, trojan infection, sudden shutdown of system or errors such as Jet engine error, “Unrecognized Database Format filename.mdb” or any other errors. 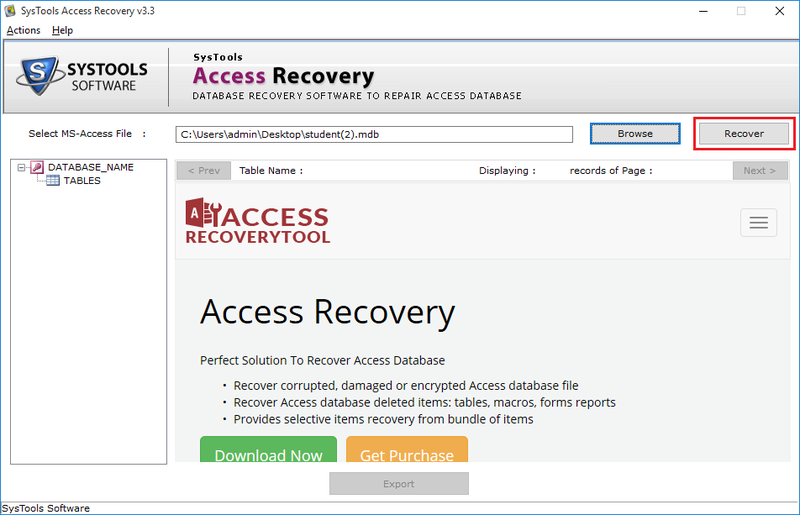 The Access Database Recovery tool works in almost all of the cases. Once the whole MDB file gets scanned, this tool generates a preview of entire data on its panel. It helps you to select any of the tables and view its content along with its associated properties. MDB File Recovery Software also allows you to move items via arranging the attributes of it. This software scans and repair Access Database files(MDB and ACCDB). The MDB File Recovery tool can restore Queries, tables, classes, macros, forms and other data from MDB file. 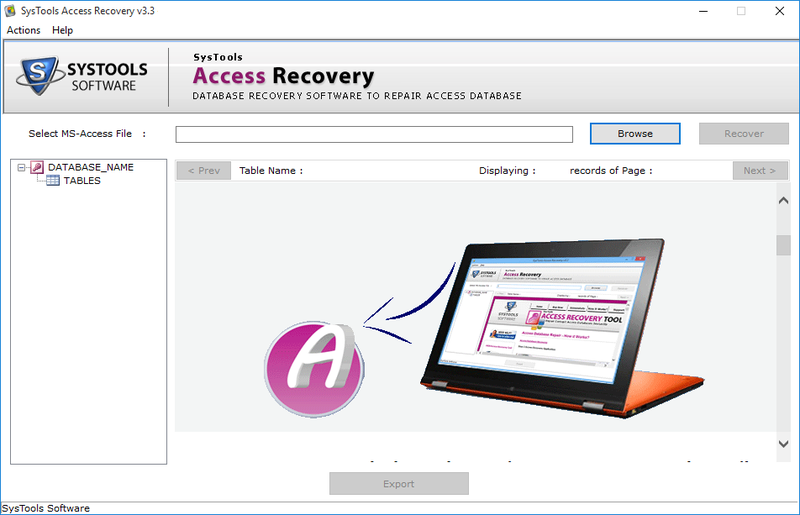 The Access Database File Recovery Software ensures that no changes or loss of information will be encountered during the restoration process. While performing scan and analyzing corrupt MS Access MDB or ACCDB file, the Access Database Recovery Software shows a real-time process. You can view the details of files being processed such as Database name, file storage format and the number of tables found in an MDB file. The MDB File Recovery Software lets you save selective items from MDB file. You can check/uncheck the required tables to export them into the local system. 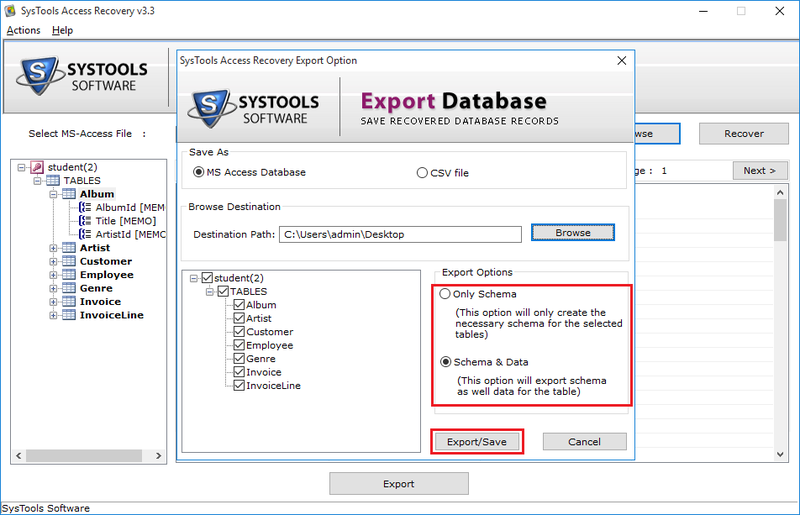 It exports entire database tables by default and save them at the chosen location. Once the complete recovery of damaged MS Access database is performed, the ACCDB Recovery Software lets you choose your desired location to save the file. Along with this option, this tool also allows you to create a new folder on your local system directly from its software panel. 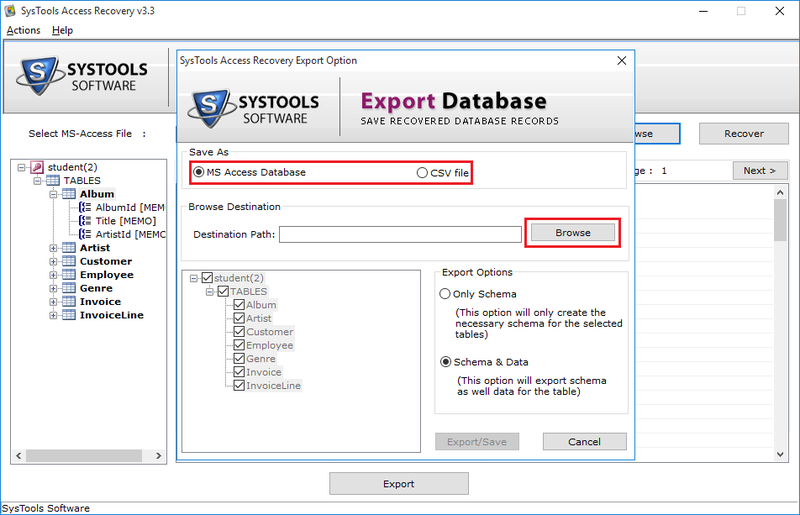 Save as MDB File – It will create an MDB file on exporting the recovered Access database. Save as CSV File – This option will save restored data in CSV file format. 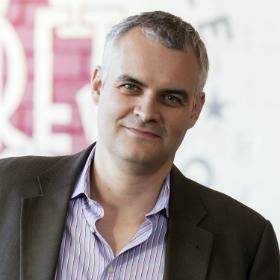 Save with Schema – Creates schema only of selected/each table(s). Save Data & Schema – Saves both data and schema of selected tables. 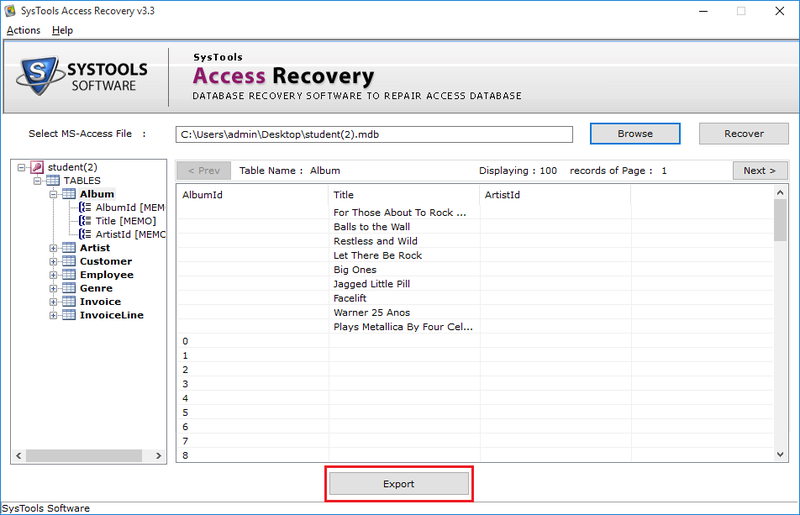 Trial version of Access Recovery software only generates a preview of recovered contents of database file. What is the maximum size of ACCDB & MDB file which the tool supports? No, the ACCDB repair software does not enforce any file size limitation. You can restore corrupt MDB and ACCDB file of any size. Can this tool recover Access database from all types of corruption? Yes, you can eliminate almost all corruption problems such as Jet engine error, “Unrecognized database”, “The database is in inconsistent state” and other corruptions easily. 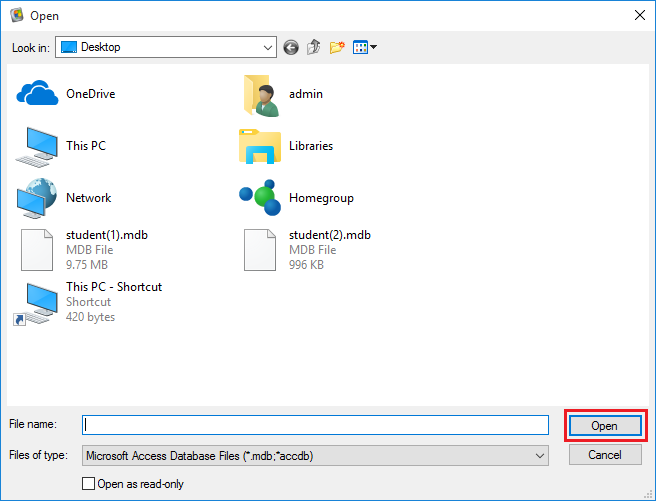 Can I perform MDB file recovery without installing MS Access on the local system? No, MS Access should be installed on your local system while performing MDB & ACCDB restoration process using Access Database Recovery tool. Does this tool restore a multi-language MS Access database tool? Yes, MDB Recovery software is built to understand multiple languages like: Spanish, German, etc. so that it can recover those databases too. Is there any need to install .net framework to restore corrupt ACCDB & MDB file? No, there is no need to install any .net framework to retrieve corrupt MDB & ACCDB file using Access Recovery software. Does this tool restore all components of MDB and ACCDB file? Yes, this MDB recovery software supports repairing and restoration of all components of ACCDB and MDB file. Can I recover permanently deleted records from Access database file using this tool? Yes, Access Recovery tool allows you to scan and recover permanently deleted records from MDB and ACCDB file. What are the foremost reasons of corruption in Access database? Access database is prone to corruption too likewise other computer files. The foremost reasons are almost same in all corruption cases such as bug attack on access program, virus infection on database, sudden shutdown of the system, software malfunction, etc. MDB Recovery tool is amazing software to restore data from MS Access database as I was unable to retrieve data from corrupt Access database. 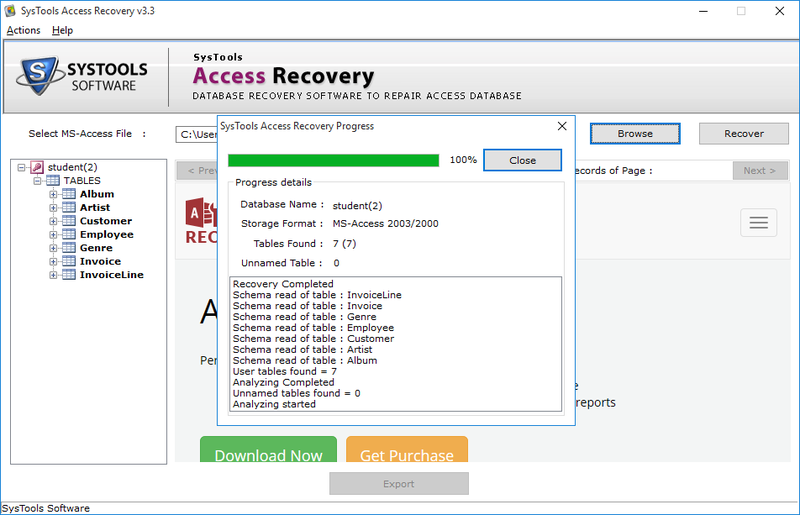 I did a lot of analysis and then came across this best MDB File Recovery Software with the help of which I was able to recover Access data without any data alteration. I had a collection of MS Access databases and almost all of them were around 2 GB. This had started reaching to corruption state causing various problems whenever I try to access it. 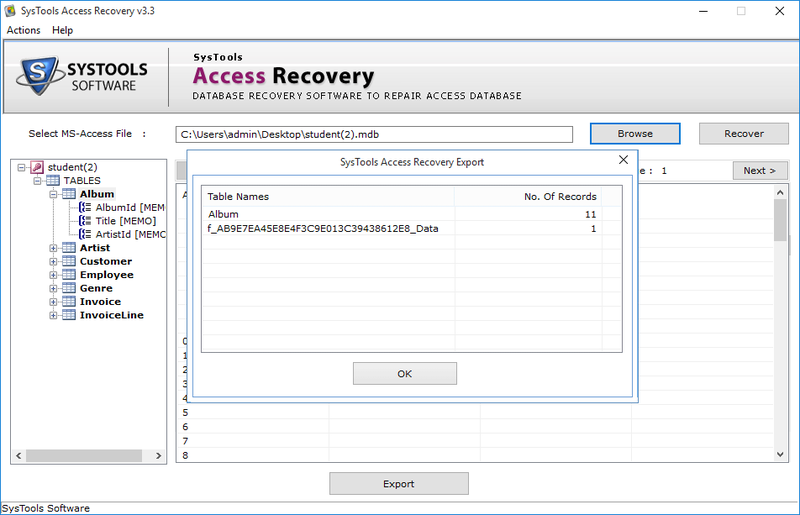 Thanks to Access Recovery tool that helped me to recover my MDB data. Our company’s Access database holds a really important place with which we can never compromise but MDB corruption made this happen but thanks to MDB Recovery tool which helped us to overcome even the severe level of corruption. This software works great. I used it to recover data from MDB file. It worked exceptionally great as I was able to restore all my data from the file. One more thing that I liked is its user-friendly interface which made my task easier.